It has been 14 months since the New Horizons spacecraft flew past Pluto and its moons, but data still continues to come in, and new discoveries are still being made. The dwarf planet has surprised scientists by its geological activity, for the most part unexpected for such a small, cold body. Now two new results are adding to the mystery of Pluto: the detection of x-rays emanating from the surface and new evidence that Pluto “spray-paints” the north pole of its largest moon Charon a rusty red colour. First, those x-rays. The detection was made using NASA’s Chandra X-ray Observatory, and then the results were compared to what New Horizons had found during its close flyby. This is the first time that x-rays have been found coming from Pluto. The Chandra space telescope had been aimed at Pluto several times when New Horizons was both approaching and leaving Pluto. X-rays were detected all four times that Chandra was aimed at Pluto, from February 2014 to August 2015. X-rays were not expected to be discovered at Pluto, since it is so small and cold and has no magnetic field. However, there was another way that Pluto could create x-rays: from the interaction between the gases in a planet’s atmosphere and the solar wind coming from the Sun. 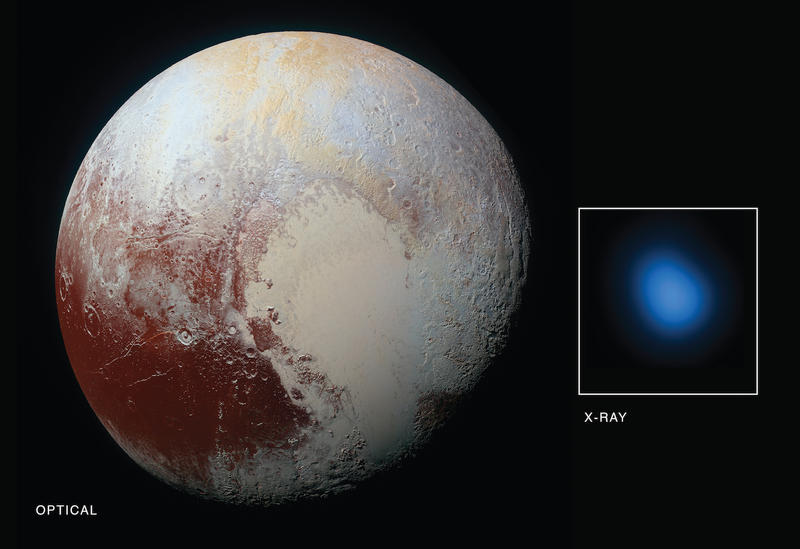 Pluto’s atmosphere is very thin and tenuous, but apparently is enough to create x-rays. Two decades ago, a similar detection was made of x-rays coming from a comet. One of the instruments on New Horizons, the Solar Wind Around Pluto (SWAP), measured the “bowshock,” where the solar wind first “meets” Pluto and its atmosphere (similar to a shock wave that forms ahead of a supersonic aircraft) and forms a small wake or tail behind the dwarf planet. When the data from Chandra was first examined, however, it showed that the brightness of the x-rays around Pluto was much higher than expected. It isn’t clear why the difference between the New Horizons and Chandra findings, but for scientists that is just an opportunity to learn more. 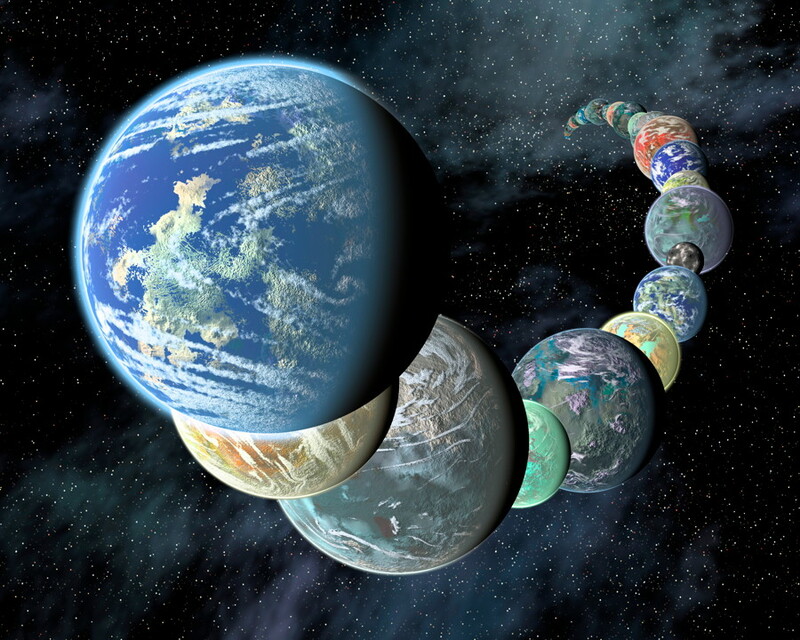 Possibilities include a wider and longer tail of gases trailing Pluto than New Horizons had detected, interplanetary magnetic fields focusing more particles than expected from the solar wind into the region around Pluto, or the low density of the solar wind in the outer Solar System at the distance of Pluto may allow for the formation of a doughnut (or torus) of neutral gas centered around Pluto’s orbit. 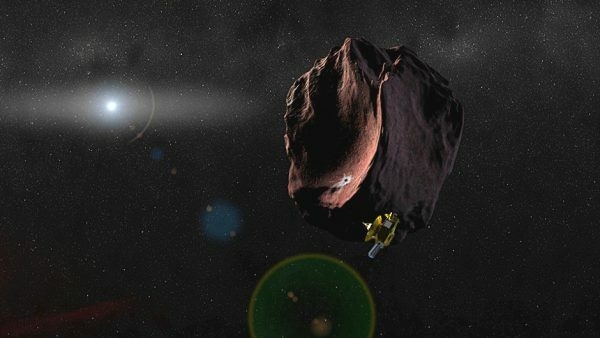 New Horizons will be able to continue studying the x-ray emissions as part of its extended mission as it continues to travel further into the Kuiper Belt. On Jan. 1, 2019, it will fly past a smaller object called 2014 MU69; it is thought unlikely to detect any x-rays there, but Chandra will be looking at other larger and closer objects in the Kuiper Belt as well. One of the other surprises of the New Horizons mission was about Pluto’s largest moon, Charon. 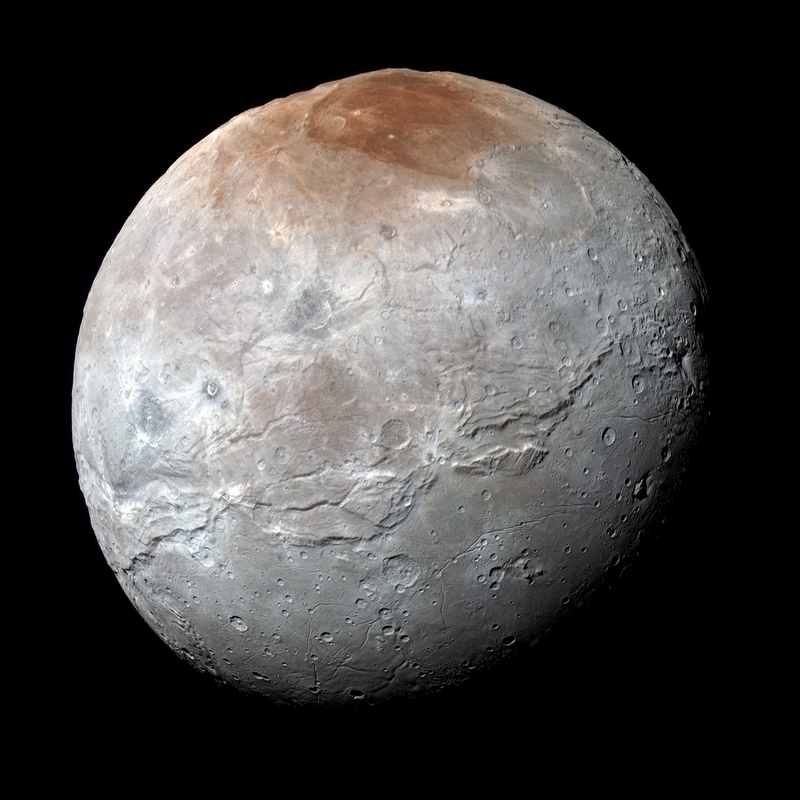 When the first close-up images were sent back, it was seen that Charon had an unusual reddish blotch at its north pole. The otherwise grayish moon had a reddish polar hood, but why? As had been surmised, and now substantiated by additional research, the colouring comes from Pluto, as methane gas escapes Pluto’s weak gravity and re-freezes on Charon at its north pole. Ultraviolet light from the Sun then changes the material into heavier hydrocarbons and eventually into reddish organic materials called tholins. In essence, Pluto is “spray-painting” its largest moon. It had been speculated before that Pluto and Charon could “share an atmosphere,” something not yet seen elsewhere in the Solar System. Analysis of images of Charon taken by New Horizons was combined with computer models of how ice would be expected to evolve at Charon’s poles. What was found was evidence for “extreme weather” at Charon’s poles, where 100 years of continuous sunlight alternate with another century of continuous darkness. Surface temperatures during the dark winters were found to dip to -257 Celsius (-430 Fahrenheit), which is cold enough for methane gas to freeze into solid ice. “The methane molecules bounce around on Charon’s surface until they either escape back into space or land on the cold pole, where they freeze solid, forming a thin coating of methane ice that lasts until sunlight comes back in the spring,” Grundy said. The methane ice then sublimates away, leaving behind the heavier hydrocarbons which then become transformed into the reddish tholins. When spring comes back to the moon, the increasing sunlight converts the methane ice back into a gas. As well as glacier-like plains of smooth nitrogen ice, methane snow on mountain peaks, and possible cryovolcanoes (ice volcanoes), other research now suggests that Pluto may have a subsurface ocean of water, similar to some of the moons in the outer Solar System, such as Europa and Enceladus. Even Charon is thought to have once had an interior ocean, but now likely completely frozen. 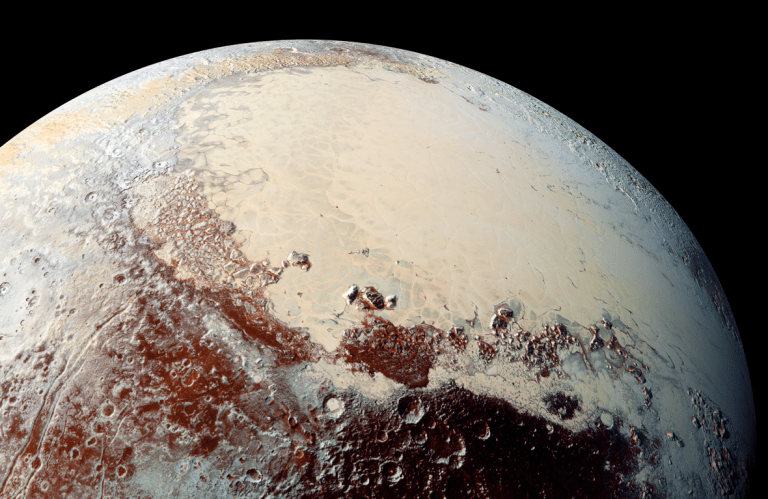 There is also evidence that Pluto used to have rivers and lakes of liquid nitrogen. How exotic is that?